Prasanthi Nilayam is not my home; my home is in your heart. Mahasamadhi (literally, great samadhi) the realized conscious departure from the physical body. 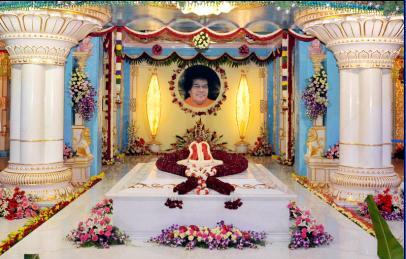 Bhagawan Sri Sathya Sai performed Mahasamadhi at 7:40AM on 24 April 2011. Mahasamadhi also refers to the shrine where the physical body is buried. The Divine Physical Frame was placed in a specially made vault, 7 feet by 12 feet, on the very podium that Bhagawan used to adorn during His darshan sessions, on the verandah of the mandir in Prasanthi Nilayam on the morning of 27 April 2011. This is the Mahasamadhi of Bhagawan.